Polari 3.18.1 also commonly known as “It’s Yoghurt. It’s French” was released recently and I wanted in that relation to cover the latest whereabouts in Polari. 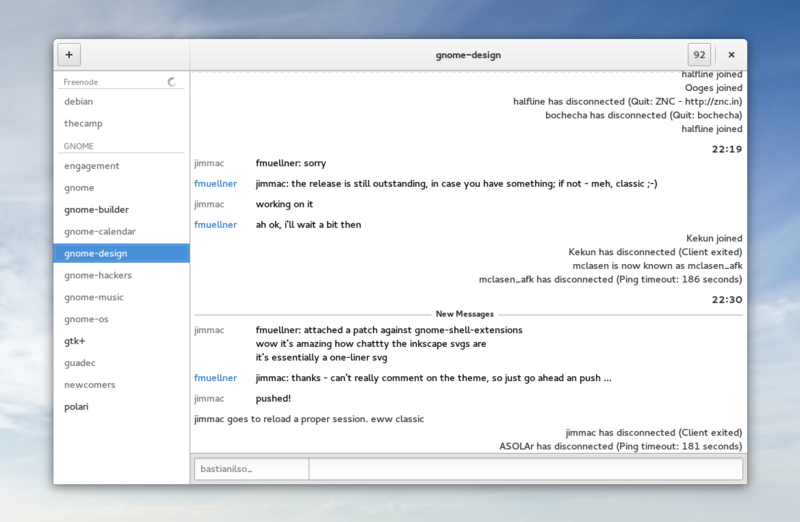 To ensure that we can use a paste service which is distro-agnostic, GNOME’s sysadmin team has launch paste.gnome.org which is based on Sticky Notes. Polari will paste to this service if you attempt to paste more than 5 lines of text into the chat entry. We have had awesome help from new contributors: Cody Welsh, Kunaal Jain and Jurijs KolomijecS have in total fixed 5 bugs. It’s really awesome to see some new nicks in #polari! Private messaging people with capital lettes in their name no longer creates duplicate entries in the sidebar. The roomlist header now higlights on hover if it is sensitive. When a connection is renamed the roomlist is resorted. The join dialog now assumes you wish to join a room on the currently active server of the room in the chatview. We will soon enter GNOME 3.19 territory and I do plan to get as much of my useful GSoC work landed as possible. At the moment I’m entertaining myself more with some design work which hopefully can make some interesting projects in the future.